Have you ever seen a game of bubble soccer wherein players, who appear like a ball themselves, compete with each other to eventually outscore each other? The chances are that you might have seen this funny-looking game already on you tube or other social media platforms, but you do not know that it is actually called bubble soccer. If you’re wondering why players are wrapped in a giant rubber ball then you should know that this is what makes this sport more interesting to play and watch as compared to traditional soccer. Bubble soccer shares some rules with traditional football, but the way it is played and equipment needed to play this game are different. Have you ever thought of playing bubble soccer after watching this sport which is enjoyed by the viewers and players alike? If yes, then it’s time to explore this game because it is a great way to spend time with your kids, family and friends. You do not need a large soccer field or minimum of 11 players each side to play this game. This is where the main difference lies between traditional soccer and bubble soccer. 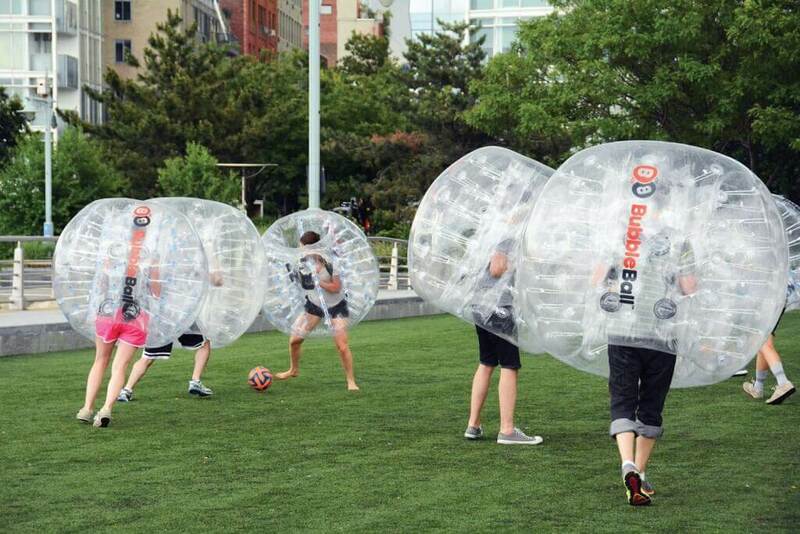 Let us read about some common FAQs about bubble soccer. What makes bubble soccer ideal for kids? Bubble soccer is considered as ideal for kids because they do not have to adhere to hard and fast rules of traditional soccer. 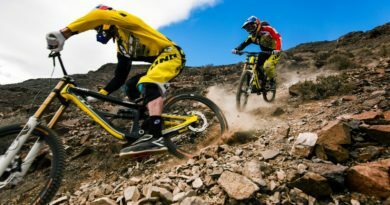 Since there’s no direct physical contact involves, this sport considerably reduces the chances of kids getting injured while playing this sport. You can bump into each other to prevent your opponent from scoring a goal. For kids, this sport is more of a fun and enjoyment because they can find themselves rolling around and laughing. They even forget they are playing soccer with so much fun on the ground. How bubble soccer is different from traditional soccer? The first rule of this sport is that play should not start unless both teams have no fewer than 3 players. Minimum requirement for play to commence is 3 players on both sides and the number of players can increase. Each and every player playing on the field will not be allowed to step on to the field unless he’s wearing a bubble waist up. Bubble should be worn properly with all straps in place and head at least 6 inches below the top. Substitutions are allowed in bubble soccer. A new player entering on the field is checked for equipment by the referee before he’s allowed to play the game. A player that falls on the ground after receiving a bump from the opposition, is allowed to get up and regain his balance before the opponent team members can try to make any contact with him again. Referee blows a whistle to stop the play at half time or to stop the play. All players should terminate the game as soon as they hear the whistle blow. A stalled game is resumed only when the referee blows whistle again. What is the duration of the match? There’s no fixed or pre-set duration of a recreational bubble soccer match. The referee gets to decide the length of the game after determining how players are feeling. Competitive bubble soccer match usually does not last for more than 12 minutes. Half time break is of 5 minutes and there are plenty of substitutions allowed as players do get very tired. How do you become a member of BBA Bubbleball? 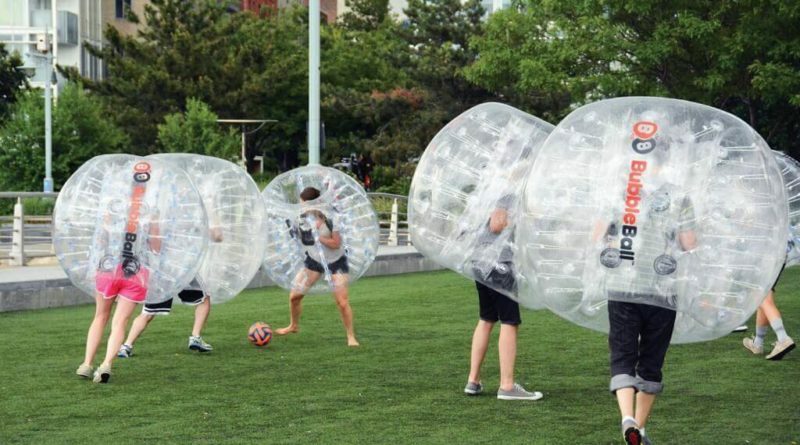 Yes, bubble soccer is relatively safe because there’s no direct physical contact involved, unlike traditional soccer. 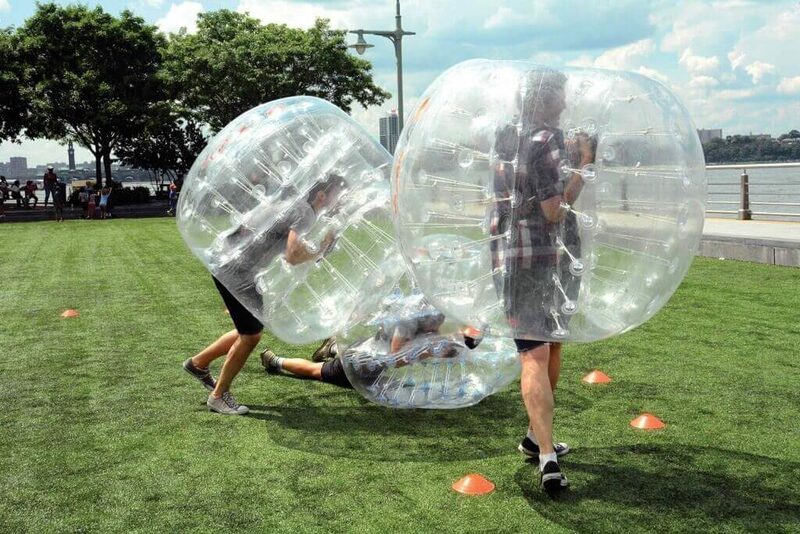 However, injuries can happen if players do not wear bubble ball equipment as instructed by the referee, or do not follow the rules laid out by the referee during the game.